These Paleo fish tacos will satisfy any hankering for this famous Baja dish. Crispy fish served atop a bed of spicy (YET DAIRY FREE!) slaw keeps the carbs low for those who prefer….but wrapped up in a tortillas, these are equally as satisfying! I discovered a new appreciation of fish combined with Mexican food when I lived for month in Culíacan. Coastal states all over Mexico have an abundance of fresh seafood, and I had it prepared more ways than I can count. It helped turn this fish hater into a person who enjoys all variety of light fish and shellfish today! Some 40 or 50 years ago, someone developed the quintessential fish taco: crispy fish with some fresh cabbage wrapped up in fresh corn tortilla and a drizzle of crema and lime. Perfection. Along the way there have more adaptations they you can shake a stick at, but these Paleo fish tacos are perfect for those watching their carbs and avoiding grains and gluten! I created the spicy slaw for me as way to still enjoy fish tacos without the addition of corn tortillas. But, you could definitely add those back in here!! Good either way, these fish tacos absolutely never disappoint! Want some more Mexican themed dinners? Here are a few you could try! ½ cup mayonnaise I use my homemade mayonnaise . Toss in the cabbage, cover, and place in the fridge for serving. Preheat a large skilletover medium heat and set your oven to a warm setting. Place a cooling rack over a plate or cookie sheet, set aside. Mix all the coating ingredients (all but the fish) together. Coat the fish liberally on all sides. Once your pan is hot, add 2 - 3 tablespoons avocado oil (or other high heat oil) to pan. Swirl and heat briefly, then add some pieces of coated fish, ensuring there is no crowding in the pan which will not allow for proper crisping. I do this in 2 - 3 batches. Once the first side is golden brown and crispy, use a sturdy spatula to flip to the other side, and brown, about 4 - 5 minutes per piece. When done, place the fish on the cooling rack in the oven to keep warm while you finish the remaining fish. Serve the crispy fish atop a bed of the spicy slaw and add some avocado slices if you wish. Yay! So glad they hit the spot! Love that spicy slaw! Definitely making this – my girls will adore the crispy fish! I’ve got to try these. Delicious and healthy. Love it! We’re always looking for more ways to eat fish – these tacos look perfect. Looking forward to making these! 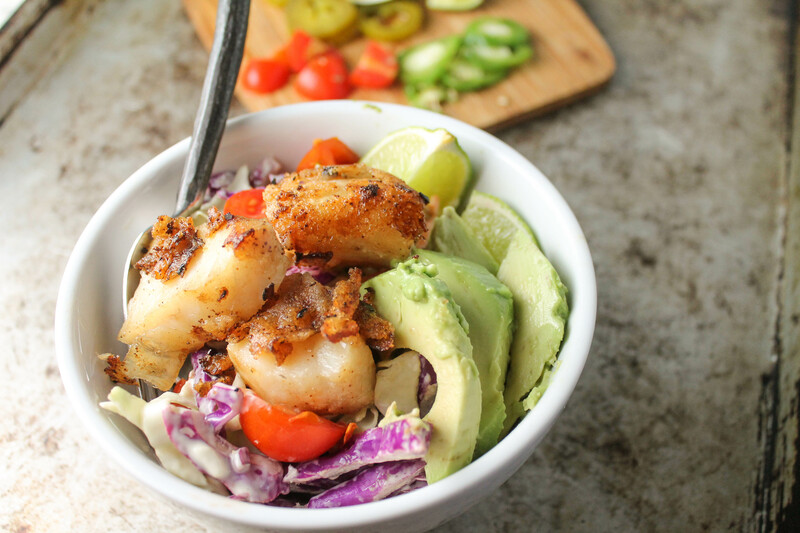 I love fish taco bowls, and we do a couple of things similar, but I noticed you use pickled jalapenos in your slaw which is nothing short of revolutionary – I just added them to my grocery list! Go get them!! I buy them in bulk….yeah, we’re that bad!!! Fish Tacos are great!! This looks very delicious! YUM ! 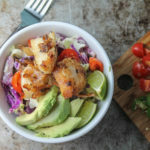 I love fish tacos and this bowl of yummy food looks so perfect and delicious ! Fish tacos are my favorite! These sound divine! Love that flaky fish! What a delicious combo, I’ll have to try these taco bowls! Fish is definitely my favourite type of taco, and these bowls look downright delicious! Been trying to eat more fish and less meat lately – this looks awesome! This looks so delicious! I love the idea of making a bowl with it- yum! it’s my favorite way now…don’t underestimate the addictiveness of the slaw Jessica!!! I love me some fish tacos. This looks delish! We live in California and i tried a bunch of different fish tacos. Will try yours version soon! Looks delish and so fresh! Fish tacos are one of my favourite foods in the world! A fish taco bowl is such a great dinner – you don’t even miss the taco shells! I so love that you serve this over slaw!! What a satisfying and yummy meal!! This is awesome. I was *just* thinking last week that I needed to find a paleo fish taco recipe, so also insanely timely. Fish tacos from the coast in Baja is what won me over to a bit of fish too. 🙂 I love that you paired it with cabbage! A natural partner, for sure!! I’ve never had fish tacos! I can’t wait to try this recipe! One question, which fish goes best with fish tacos? any white fish works! Halibut, cod, tilapia, etc. I use the wild caught cod from Costco. I love fish tacos, this looks great! That fish looks so crispy! I can’t believe it’s gluten free! Yummy! A favorite at our house! Love tacos! The carbs? Not so much. This is a great way to have all the flavor with none of the pesky carbs! Oh that crispy fish!!! Wow that looks good! I’m going to have to make this for my family soon. 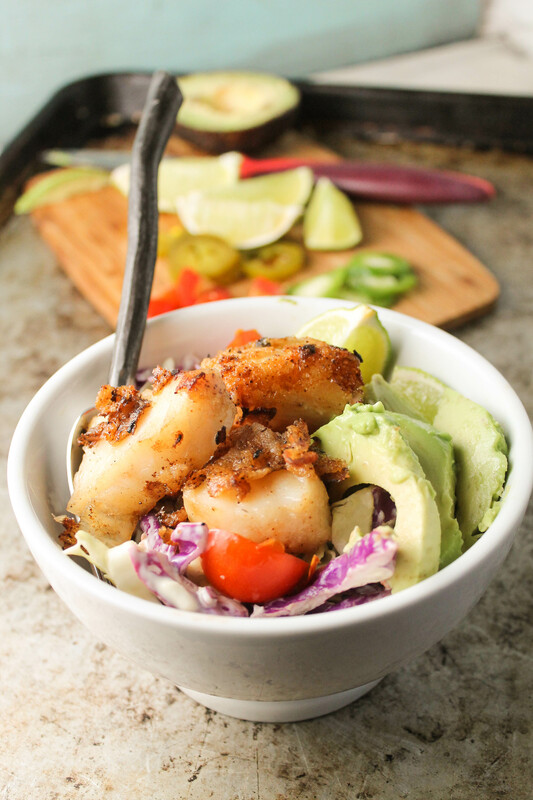 That slaw looks so good and what a great idea to have a fish taco bowl! I will have to try it with grilled fish but other than that looks perfect! I love grilled fish too!! Just take the same spices and slather the fish with them first!! Fish tacos are my favorite kind of tacos so you know I’m definitely all about this recipe! THIS is what I want for breakfast this morning! 😉 SO delicious!! I love this dish!! So good! This was so delicious I especially liked the coleslaw. Thanks Dale…that slaw is something else, isn’t it!!?? thanks so much for your feedback! I LOVE LOVE LOVE fish tacos, looks delicious!!!! I know Cassidy, fish tacos are addicting! !